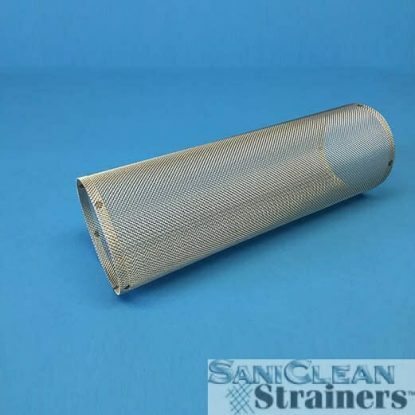 All SaniClean Wire Mesh OverScreens are fabricated using 316L SS wire mesh. The mesh specification complies with ASTM E2016 Standard Specification for Industrial Woven Wire Cloth. The 316L SS wire is compliant with ASTM A580 Standard Specification for Stainless Steel Wire. All OverScreens have a continuously welded overlapped longitudinal seam; the welded seam catches both the outside edge and the inside edge of the wire mesh at the seam so as to ensure no loose, un-welded edge wires. Cylinder ends are hemmed back on themselves, and tack welded to minimize the chance of any edge wire breaking off. All OverScreens are welded using a welding mandrel to ensure a consistent inside diameter of the OverScreen regardless of mesh size, wire diameter, or whether it’s a short or long OverScreen. Consistent from one OverScreen to the next. All the time, every time. All OverScreens are individually packaged and labeled to facilitate inventory management.